upon the night, trailing cotton. for miles, whole and unbroken. 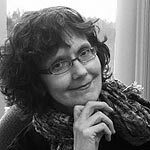 Sharon Ackerman is a poet residing in Albemarle County, Virginia. She is one of the winners in the 2017 Virginia Poetry Society’s national contest and has been published in Streetlight Magazine. Featured image: Untitled by Cigumo at flickr. CC license.